FB#42 Charles Clay put Miami ahead in the third quarter when he caught a short pass and ran over Charger defenders Marcus Gilchrist and Donald Butler en route to the end zone, making it 17-10. With C#51 Mike Pouncey out with an illness (OT#71 Martin andG#68 Incognito), the Dolphins had three backups starting on the offensive line. Working behind a makeshift line, QB#17 Tannehill was sacked four times, increasing his NFL- season high sacks to 41. Miami did average 5.5 yards per rush. The Dolphins passed the ball two-thirds of the game. On the game’s opening drive, the Dolphins marched 76 yards — with all but two passes coming through the air — for a 22-yard field goal by K#9 Caleb Sturgis in their first possession. Dolphins CB#21 Brent Grimes ended the Chargers’ first possession with an interception return for 15 yards on a deep right pass intended for wide receiver Vincent Brown. QB#17 Tannehill threw for 268 yards, including a 39-yard score to FB#42 Charles Clay, who broke two tackles on the play. Miami managed 104 yards rushing. The Dolphins (5-5) won for the second time in the last seven games. Rivers threw for 298 yards with 22 of 34 passes. Ryan Mat-hews and Antonio Gates ran for 127 yards, including a career-best 51-yard run to set up a field goal. San Diego’s Derek Cox dropped an interception in the first quarter, and on the next play, Johnny Patrick intercepted Tannehill. The Chargers scored a few plays later for a 7-3 lead. The Chargers had 10 penalties for 76 yards, including two infractions that cost them 11 points in the first half. Penalties repeatedly hurt the Chargers throughout the entire game. Corey Liuget was flagged for roughing the passer that negated a fumble recovery on the San Diego one yard line. Dolphins RB#33 Daniel Thomas answered with a one yard touchdown run, cap-ping a nine-play, 80-yard drive as Miami recaptured the lead. A scrambling Rivers found Antonio Gates for a five yard touchdown with a minute left in the first half, but the quarter-back was flagged for throwing past the line of scrimmage, and the Chargers settled for a field goal that made it 10- 10 at half-time. A drive in the second half stalled after receiver Keenan Allen was flagged 15 yards for taunting, and the Chargers’ defense was penalized four times for offside penalties. FB#42 Charles Clay put Miami ahead in the third quarter when he caught a short pass and ran over Charger defenders Marcus Gilchrist and Donald Butler en route to the end zone, making it 17-10. Clay led the Dolphins with six receptions for 90 yards. The Miami Dolphins defense man-aged to get to Rivers on their next possession, which forced a punt. The Chargers inched within one point of the Dolphins with a pair of field goals to trim the lead to 17-16 early in the fourth. Trailing by four points, San Diego started from its own 17 yard line with less than two minutes left and drove to the Miami 25 yard line. On the final play, a hurried Rivers floated a pass to Vincent Brown in the end zone, but CB#21Grimes slapped the ball away. CB #21Brent Grimes broke up Philip Rivers’ final pass in the end zone as time expired, and the Miami Dolphins beat the San Diego Chargers 20-16 on Sunday at SunLife Stadium in Miami, Florida. At the end of a dismal week, the Dolphins finally had some-thing to celebrate. 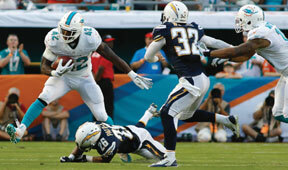 The Chargers (4-6), who were plagued by penalties and missed tackles, lost their third game in a row.